In the theme of undervalued asset managers I wanted to talk about Charlemagne Capital, a UK asset manager. The company manages a variety of emerging market focused funds including mutual funds, hedge funds, pooled accounts, and institutional funds. The company is listed on the AIM, trades in GBP but lists its accounts in USD. This idea was presented to me by a blog reader in the comments of my previous post on Argo group. The company sells its products to investors in Europe, the mutual funds are listed for sale in the following countries: Austria, Denmark, Finland, France, Germany, Ireland, Italy, Luxembourg, the Netherlands, Singapore, Sweden, Switzerland and the UK. I had trouble getting specific fund performance from the company because a login is required to view performance stats. I attempted to register but have a feeling it was rejected because I put "USA" in my address. What I did find was impressive, the OCCO hedge fund has returned 83% verses a 10% index return over the past five years. As of June 2011 Charlemagne Capital had an AUM of $3.29b. 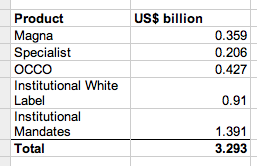 A breakdown of AUM across products is show below. The first thing I noticed is that 35% of the company's market cap is held in cash and securities. The second aspect is that the only other aspect of NCAV is receivables, being an asset manager there is no inventory. This is good, cash and receivables are most likely to be liquidated at full value. Asset managers are valued as a percentage of AUM plus cash and investments, I discussed this in a previous post about Argo Group. Here is an expanded spreadsheet showing some comparisons to other asset managers. All values below are in USD. I get a downside of 6p which I consider unlikely considering the company is profitable and an upside ranging from 20p to 42p. 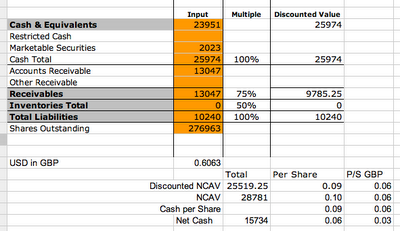 Even valuing the company at 2% of AUM plus cash and investments gives a 25% upside. I have the top value of my range at 5% which is still a bit on the low side, but I think a realistic value. I think Charlemagne Capital has the potential to be a very good investment, the company is clearly undervalued compared to other asset managers. In addition they are profitable and earning performance fees from the funds they manage. At the current valuation emerging market assets don't even need to grow for an investor to realize value in Charlemagne capital. Charlemagne Capital provides emerging market exposure indirectly to an investor which could be a good diversifier. In addition to the valuation tail winds the directors own 33% of the company and management is actively fund raising and promoting the funds. You should get some more info from the link above. I had a look at Charlemange a while back but my concern is that AMs are just levered beta positions particularly an EM manager which will probablly have a lot of "hot" money (the strength of EMs are as consensus as saying the sky is blue which is worrying considering the macro/political risk in these places). I agree on the levered beta view as well, that's partially why I prefer Argo to Charlemagne. 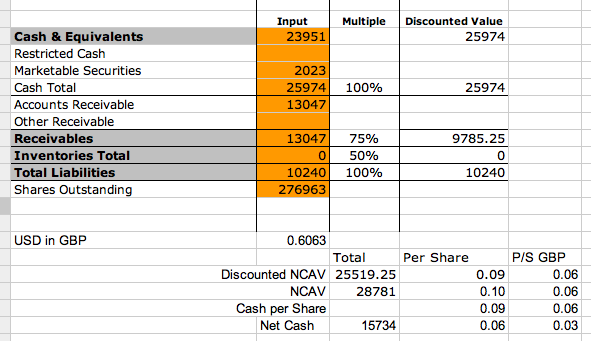 While CCAP has better numbers and is cheaper than ARGO, ARGO is trading at a discount to NCAV giving me a margin of safety. In addition ARGO seems to be hitting some trough numbers with regards to performance, even if 100% of AUM fled and the funds were shutdown I would still realize a liquidation return of 10p above my cost. Take a look at US Global Investors (grow) and hennessy advisors (hnna) both very cheap on a Mkt cap/AUM ratio. Not net-nets but provide some operating leverage to two interesting themes: commodities/em and japan.